Law Firm helping employees injured on the job. Call Toll Free 1-(866) 461-9400 for a Free Consultation. If you have been injured at work you may be entitled to receive benefits for temporary total disability, partial disability, total and permanent disability, loss of function, disfigurement, medical benefits, vocational training	benefits, and in certain cases, double compensation	benefits. Survivors/dependents of employees who are killed at work or who die from a job injury may also be entitled to death benefits. The cost of the workers' compensation benefits for injured employees or their families is paid	by the employer. Most employers have insurance that covers the cost of providing injured employees with workers' compensation benefits. 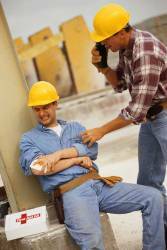 In many states, there is a special fund for injured employees whose employer is not insured. In some states, such as Massachusetts, an injured employee may bring a personal injury action under Tort Law in the Civil Courts against an employer who did not have workers compensation insurance when the employee was injured. Are There Other Benefits To Which I Am Entitled? Injured employees who are unable to work for more than one year or whose disability will clearly last for more than a year may be eligible for social security disability benefits. Social security disability can provide significant additional benefits to you and your family in addition to your social security benefits. In Social security may also provide Medicare coverage after the second year of social security entitlement. this may be important since may injured employees on workers' compensation have their health care insurance canceled after being out of work for a period of time. What If My Injury Was Caused By Another Person's Negligence? If someone other than the employee, co-employee, or the employer, is at fault in causing the employee's injury, the employee or the workers' compensation insurance company may be able to bring a suit against the negligent party (called a third party). If the employee or insurer receives monies in the third party lawsuit, the workers' compensation insurer generally has a right to be reimbursed for a portion of the benefits they had previously paid. Since the employee can seek recovery for all damages in a third party lawsuit, including for pain and suffering, the third party recoveries are usually larger than the workers' compensation payments. Therefore, it is often in the injured employee's best interest to pursue actions against negligent third parties, even though the employee may have to reimburse the workers' compensation insurer for some of the benefits paid. If the employee is successful in his or her third party lawsuit, the workers' compensation insurer may also have to pay a proportionate share of the employee's legal fees incurred in the third party lawsuit. In order to be eligible for workers compensation benefits, your case will need to be heard by a conciliator or administrative judge at the Department of Industrial Accidents. The insurance company for your employer will be represented at the Department of Industrial Accidents. Shouldn't you also have experienced counsel present. There is never a fee for our initial consultation. In addition, the law generally requires that if you are successful in your claim for workers' compensation benefits, your employer's insurer must pay your lawyer's legal fees. If your claim is settled as a lump sum, then the lawyer generally collects a percentage of the recovery. In addition, your attorney's out-of-pocket expenses in preparing your case are generally also paid by the insurer. There are only some costs that an employee may have to pay initially, and eventually seek reimbursement from the insurer. If you have questions about a potential workers' compensation claim you should contact a competent attorney immediately for a free consultation. If you or someone you know have been injured at work, it is important to obtain immediate legal help from a competent attorney. Call Toll Free 1-(866) 461-9400 for a Free	Consultation.